According to a LifeWay Research study in 2017, 53 percent of Americans have read little to nothing in the Bible, and one in 10 Americans have never read the Bible. With this decline in reading scripture, many pastors fear our churches will become biblically illiterate. There is, however, a longstanding tradition within Texas Baptists churches to equip children and youth in scripture memory and Bible knowledge, a program we know as Bible Drill. Bible Drill exists to develop biblical memory skills for children and youth from 4th-grade through high school. These students memorize the order of books in the Bible as well as passages of scripture. Bible Drillers even learn ways to apply the meaning of scriptures to their own lives. By our church’s giving through the Cooperative Program, we support ministries like Bible Drill that are making an impact on our youth. 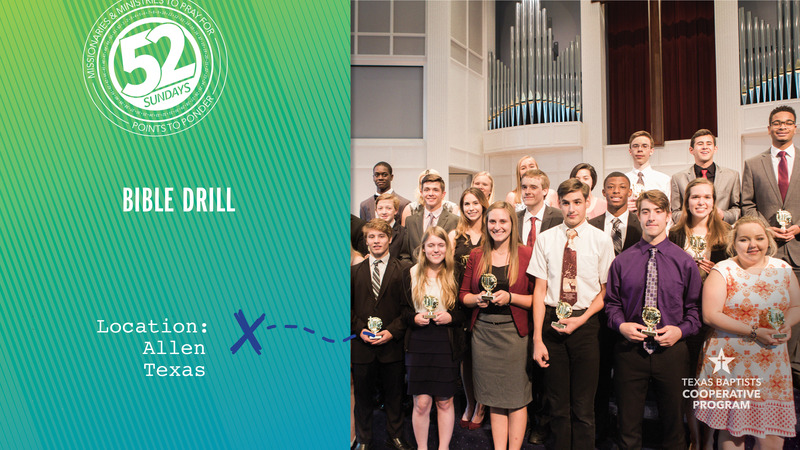 Let’s pray for Bible Drill, for those on the Texas Baptists Great Commission Team who facilitate it, and for the students who participate.